Home news VIEW FROM SPACE: CHINA'S ISLAND BUILD-UP. VIEW FROM SPACE: CHINA'S ISLAND BUILD-UP. Satellite images reveal the scope of China’s expanded presence. 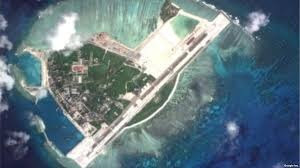 In 2015, China began pumping sand onto disputed reefs in the Spratly Island group of the South China Sea. Three years later, what used to be partially submerged coral features are now fully fledged islands, hosting buildings, ports, and runways. SpaceKnow looked at satellite images over the past decade to analyze the increase of infrastructure, land mass, ships, and planes in the disputed South China Sea. Our analytics are capable of detecting patterns and changes over a period of time for visualizing and assessing change. We recently looked into the buildup of islands in the Spratly Islands from 2009 through 2018. These selected images showcase the larger trends at play for some of the Spratly Islands, including an increase in urbanization as well as the deployment of boats and ships to the new facilities. Founded in 2013 in San Francisco, CA, SpaceKnow’s mission is to provide transparent access and analytics of satellite imagery to the world. SpaceKnow’s team of imaging scientists and software engineers measure and anticipate events by analyzing patterns in the imagery data.